The small town of Sukhothai is located 256 miles (415 km) north of Bangkok and 121 miles (195 km) south of the very popular destination Chiang Mai. 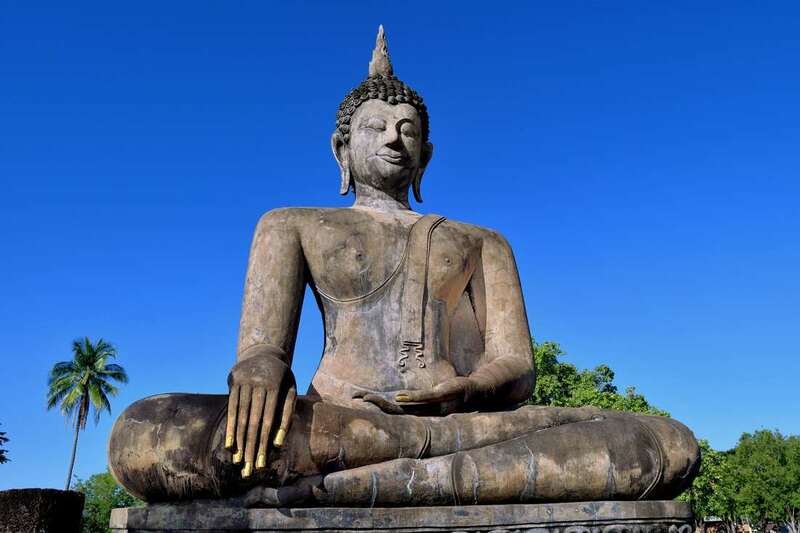 Travelers who are planning on making the journey from Bangkok to northern Thailand by bus or train should consider stopping in Sukhothai for a day or so to break up the long trip and learn about Thailand’s ancient history. The Kingdom of Sukhothai was the country’s first capital and existed from 1238 until 1583 AD. It is fair to say that Thailand’s modern history began in Sukhothai. King Ramkhamhaeng, who ruled from 1279–1298, is considered to be Thailand’s first great king. He is credited with the invention of the Thai alphabet and is pictured prominently on the back of Thai bank notes. Today Sukhothai is best known for the Sukhothai Historical Park a UNESCO World Heritage Site. The 27 square mile (70 km²) park contains the ruins of a number of Buddhist temples and other monuments which have been painstakingly restored to prevent further deterioration. The moats and grounds around the ruins are clean and well maintained; overall the park is quite lovely. The best way to tour the park is by bicycle which can be rented at the park’s entrance. Located opposite of the park is the Ramkhamhaeng National Museum. A visit to the museum is a great way to learn about the history of Sukhothai and one of modern Thailand’s greatest leaders. Sukhothai is a particularly popular place to visit during Thailand’s annual Loi Krathong festival. 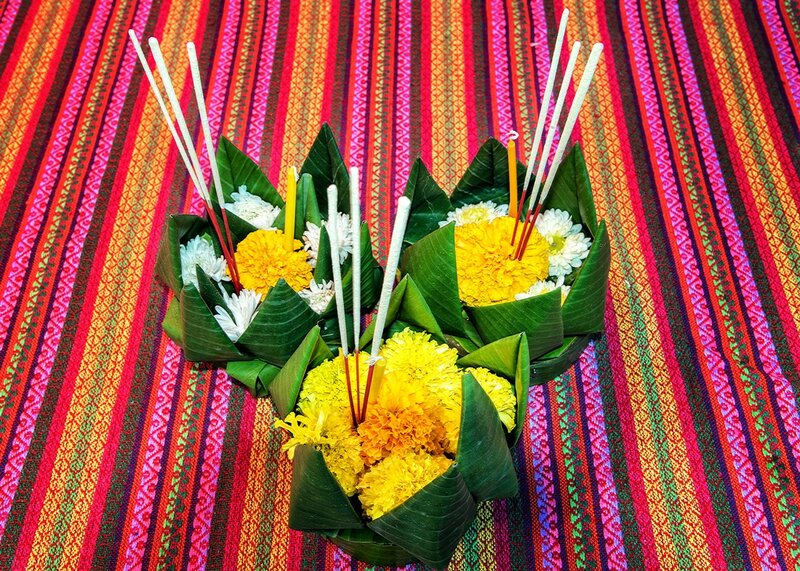 In English Loy Krathong roughly translates into “float a basket”. During this hugely popular festival, Thai people construct ornately decorated baskets from banana leaves and fill them with flowers, candles and incense (joss) sticks. Festival-goers light the candles and incense, say prayers to the water goddess and float their krathongs on lakes, rivers and streams. As the krothong floats away, so does bad luck, worry, anger or any misfortune from the previous year. Loi Krothong is traditionally celebrated sometime in November; the exact date is determined by the Thai lunar calendar. The park is located in an area known as old Sukhothai which is dotted with hotels, guest houses and restaurants. In New Sukhothai, 7.5 miles (12km) east of the historic park, there are a number of budget guest houses which are conveniently located near the bus station. Traveler’s staying in New Sukhothai can easily catch a ride in an inexpensive songthaew to the park or restaurants in Old Sukhothai. Sukhothai is a popular stop on a well worn traveler’s path which includes Bangkok, Ayutthaya, Lopburi, Chiang Mai and Chiang Rai in the far north. From Bangkok buses regularly depart the northern bus terminal which is also known as Mo Chit; the trip takes approximately seven to eight hours and costs around 350 Thai Baht. Another inexpensive option is to take a train from Bangkok’s Hua Lamphong railway station to Phitsanulok and then take a bus or mini-bus (van) the remaining 37 miles (60 km) to complete the journey. Ten trains depart the station daily; travel time and fare varies depending on which train number and seat class is chosen. It is advisable to consult the timetable and fares page of the State Railway of Thailand website before arriving at the station. Travelers continuing north to Chiang Mai can do so easily and inexpensively by either bus or train. Six trains depart daily from the Phitsanulok Railway Station. The trip takes seven to eight hours and third class tickets on an “ordinary’ train cost a mere 65 Thai Baht or less than $2 USD. Numerous buses depart Sukhothai for Chiang Mai each day. The trip takes around five hours and costs approximately 350 Thai Baht.